Kopf kein Kriegsverbrecher dank Brandt ? examine the man further. He can be contacted by means of Mr. Brandt. Welche Stellungnahmen zu den einzelnen Vorwürfen hatte Herr Kopf abgegeben ? offence whether a pole or German. without giving notice. I have no knowledge at all of what happend to him afterwards. I have in no case appropriated Polish property or acquired it in any other illegal way. Sadowa without differentiating between any nationalists. Herr Kopf erschien nicht bei Gericht. befindet sich der einzige report in Niedersachsen ? War es wirklich der einzige Bericht ? ......... 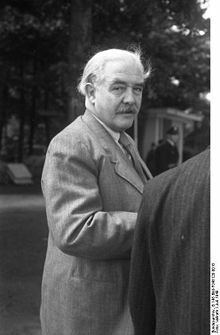 Your research concerning Brandt-Kopf catches Brandt at a turning point of his biography, 1947/48. In the space of a few months, Brandt scrapped dreams of a “Third Way” between the US and the USSR in favor of a career in the ardently anti-Communist SPD. If you are interested in this development, I can point to an essay I published within the last year with a colleague in the Netherlands.